★ Chips look and feel good. ★ Enough chips for 10 players. ★ The case has a foam top on the upper part to protect your chip. ★ Carrying case makes it easier to tote them around on game nights. ★ It will be a great addition to your Friday night hangout with friends. ★ It holds a lot of chips its still compact enough to travel with easily and for storage when you're not using it. ★ Great for playing poker at home and with friends, and the chips have a nice weight to them that makes them fun to toss into the pot. 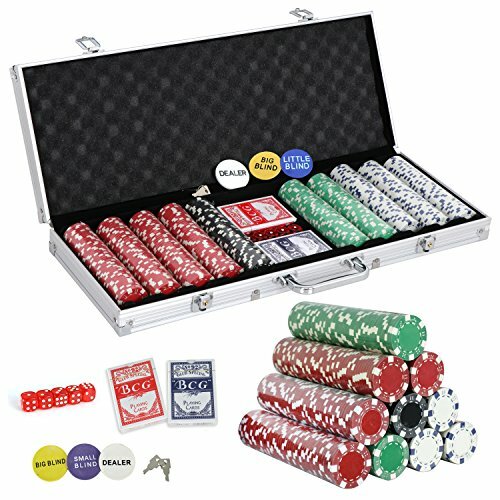 【Plenty Chips】This poker chip set comes with 500 pieces for a 6-10 person poker game. Chips are made from Polystyrene, durable enough to have held up for years of monthly poker. Case has locks and comes with 2 keys. 【Sturdy Carry Case】The carry case can hold a lot of chips and still compact enough to travel with easily and for storage when you're not using it. The case has a foam top on the upper part, will protect the chips and cards safety when transport. View More In Poker Equipment.